Pavia is a real gem of architecture. Ease of transportation and its small size make it an ideal day trip (just a 40 minute drive from Milan). 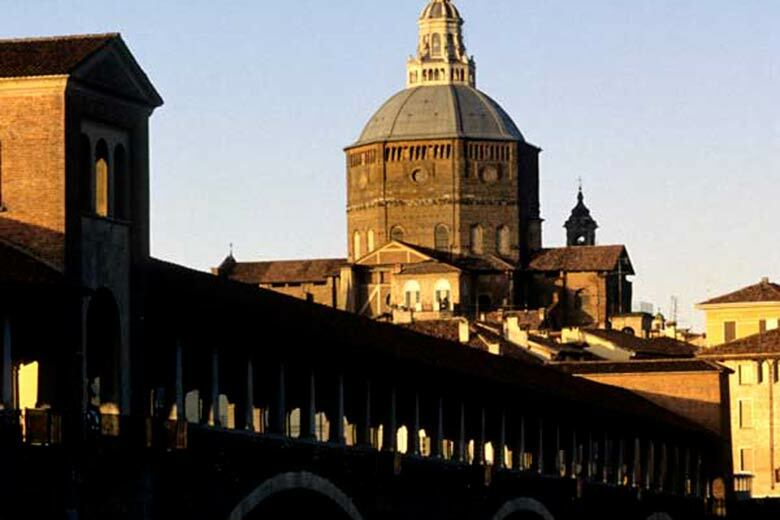 The province of Pavia is crossed by “Via Francigena”, an ideal connection between Rome and Europe and a meeting point of three Christian pilgrimages (Rome, Santiago and Jerusalem). A city once famed for its 100 towers, today Pavia still retains the charms of its ancient past thanks to its numerous historic monuments including its renowned University. The city is, in fact, the seat of one of the oldest academic institutions in Europe (founded in 1361). In fact, at all times, visitors are likely to find themselves caught up in the midst of the chattering throngs of students who crowd its streets and nearby bars. Pavia retains a number of well-preserved medieval and early Renaissance buildings and churches, picturesque alleyways and ancient squares. The historic centre and the Borgo Ticino, on the opposite banks of the Ticino river, are connected by the scenic Ponte Coperto, also known as the Ponte Vecchio. 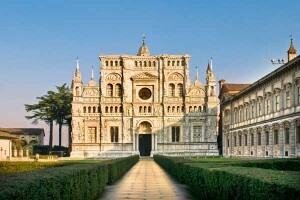 Pavia is also famous for its Certosa, considered one of the most unique buildings in Lombardy. Located 8 km north of Pavia, this historic complex was founded as an ex voto at the end of the 15th century and encompasses a monastery, a sanctuary and beautiful gardens. While in Pavia, also make sure to visit the Church of San Michele, the basilica of San Pietro in Ciel d’Oro, the Duomo and the Castello Visconteo, home to the Musei Civici, whose collections includes works dating from medieval times to the 20th century. In Pavia, shopping enthusiasts can stroll through the city’s countless narrow medieval streets brimming over with artisan workshops and high-end boutiques including famed furrier Annabella. Its main shopping streets are Corso Cavour, Corso Strada Nuova and Corso Garibaldi. Whilst browsing their wares or doing some window shopping you will also have a chance to discover several of the city’s most beautiful views. Foodies will be enraptured by Pavia’s countless food specialities, a blend of outstanding quality and delectable regional dishes, including “zuppa pavese”, “ravioli allo stufato”, “risotto alle rane” (risotto with frogs legs) and “risotto alla certosa”, created by the monks of the Certosa di Pavia. Other standouts include braised beef steeped in local red wine, boiled meat served with a peperoni or green sauce as well as a rich selection of cold cuts. Must-try addresses to savour these specialities include the Antica Osteria del Previ and Al Cassinino, as well as the unmissable Pasticceria Vigoni, the oldest pastry shop in Pavia. Located right in front of the University, it was here that Italy’s renowned Torta Paradiso (Cake of Paradise) was first invented. By car: Take the A7 Milano-Genova motorway in the direction of Genova as far as the Bereguardo-Pavia Nord exit. Continue on the A53 in the direction of Pavia and exit at the Pavia-Via Riviera exit. By train: Trains run daily from Milan’s Stazione Centrale to Pavia (www.trenitalia.com).